When we think about the benefits of swimming, the focus tends to be on those that help the body. When you swim, you become stronger, your muscles become more toned, and you increase your endurance. What many people do not realize is that swimming has incredible benefits for the brain as well. In fact, all aerobic exercises benefit the brain because they improve cardiovascular health. However, not all are as beneficial as swimming, which has been shown to deliver brain benefits on the molecular level as well as behavioral benefits that result from the impact of the exercise on neurotransmitters. How is this possible? Allow us to explain. When your brain receives a boost in blood flow—which is what occurs during aerobic activities like swimming—great things happen. You can experience better memory, improved mood, more clarity, and increased focus. But what’s interesting about swimming is you don’t need to exert yourself to enjoy these benefits; just by being submerged in water, the body increases blood flow to the brain by as much as 14 percent. Humans are not meant to be sedentary, but our modern world is set up in a way that encourages us to sit and be still more than we are active. This can cause problems with depression, anxiety, and stress management. Exercise releases neurotrophic factors called endorphins, which help to counter these issues. Not to say that mental health conditions do not require other forms of treatment, but swimming can help manage said conditions. When you are under significant stress, it damages the brain. This damage takes the form of lost neurons. However, aerobic activity promotes the development of new neurons in the brain, specifically those in the hippocampus region. This likely increases the oxygen that the brain receives when an individual is engaged in aerobic activity. Explaining this one requires a bit of scientific jargon, but bear with us. 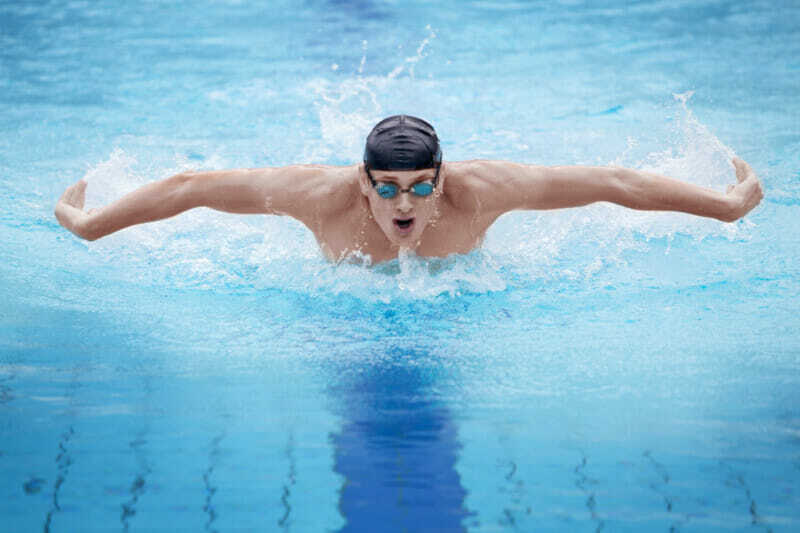 Swimming requires that the swimmer utilize bilateral cross-patterning movements—movements on both sides of the body that work with each other to facilitate the movement of the swimmer. This aids in the development of nerve fibers in the corpus callosum, which is the section of the brain that connects the two hemispheres. Studies have shown that children who start swimming at a young age can reach their developmental milestones earlier than the average child, especially concerning gross-motor and visual-motor skills. Ultimately, any form of exercise that gets the heart pumping is going the deliver benefits to both the body and the brain. However, swimming does offer some added advantages over other forms of exercise. If you are interested in seeing how swimming can help you or your child, allow Blue Buoy Swim School to help! Our expertly trained, year-round swim instructors will ensure that swimming is always a fulfilling, pleasant experience. Contact us so you can tour our facilities and enjoy your first lesson.